Last year's Numero Group pop-up. Head back to Record Store Day central. This year's Record Store Day includes two impressive pop-up shops open only for the day. 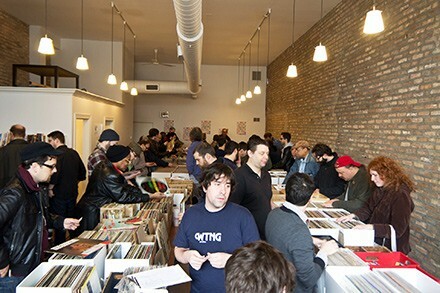 First, the Metro store (3730 N. Clark) hosts a Hot Jams pop-up shop from noon till 8 PM, which will sell back stock from defunct south-side dance-music retailer Hot Jams. Charlie Glitch of Ghetto Division is curating $5, $10, and $15 bins of records from Atlantic, Motown, Cajual, Relief, Underground Construction, and other labels; Metro is also offering deals of its own, including a split seven-inch of the Alkaline Trio/Smoking Popes gig from New Year's 2006. The folks at the Numero Group are bringing their RSD shop back for a second year, this time at the Empty Bottle (1035 N. Western), where it will be open from 9 AM till 6 PM. This year they've expanded to include more than a dozen vendors on top of two tables of Numero releases—which include an RSD-specific compilation, WTNG 89.9FM: Solid Bronze, that pays tribute to the regional comps that radio stations used to put out. WTNG 89.9 FM is also a real station for the day, with a range of about five miles in any direction from the Bottle. Quite a few stores around the city took umbrage at Numero's shop last year, seeing it as competition on a day designed to celebrate and support year-round indie record stores. But Numero's Ken Shipley doesn't see any conflict. "We continue to stand by our feeling that Record Store Day has become more about buying limited edition 'collectibles' and potentially flipping them on eBay than actually supporting your local record store," he told me via e-mail. "And since we're not offering anything limited except our own items (plus the limited opportunity to browse the bins of 15 vinyl historians, some of them world-class), we think the charge that we're taking away dollars from mom and pop stores is unfounded." Labels have certainly exploited Record Store Day to hawk limited editions of dubious merit—the Numero Group is in fact selling 100 copies of a $5 seven-inch of three old soul jingles—but a store benefits from selling records on RSD regardless of whether everyone agrees that they're worthwhile. As idiotic as I think Record Store Day is, I love record stores, and there's no question that the holiday is lucrative for them. Because Numero schedules its shop for this one particular Saturday—and because customers don't have an unlimited amount of money to spend—it's hard to argue that Numero isn't diverting potential RSD profits from stores open all year. I spoke with several shop owners—all requested anonymity—who said they felt betrayed by Numero's pop-up. One said, "We work hard to keep our doors open the other 364 days of the year, and RSD is supposed to be something of a celebration of the stores on the market." Travers Gauntt, a longtime employee of Jazz Record Mart, was more blunt: "Not only are they not participating in the RSD event, as written in the RSD rules, they are only doing it that one day—laughing in the face of all the retailers and their staff that do it for a living 365 days a year." The annual celebration of vinyl and the shops that sell it has been getting more hectic and harder to enjoy, but the Reader is here to help.